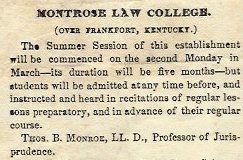 As an ambitious young man heading off to study law in the 1850s, Henry T. Harris of Lincoln County, Kentucky could have done no better than to enroll in Montrose Law College, described by its founder not as in Frankfort, Kentucky, but over it. Upon arrival, Henry Harris and his classmates found that Judge Monroe was the institution’s heart and soul. “It will be observed,” stated the prospectus, “that one Professor only fills all the Professorships in this College, but all his time, not required by his judicial duties, is employed with his students,” all of whom would have at least 3 lessons a day. Subjects ranged from civil, criminal, mercantile, maritime and international law to rhetoric, logic, and (to allow students to cut their teeth in a courtroom setting) a twice-weekly moot court. 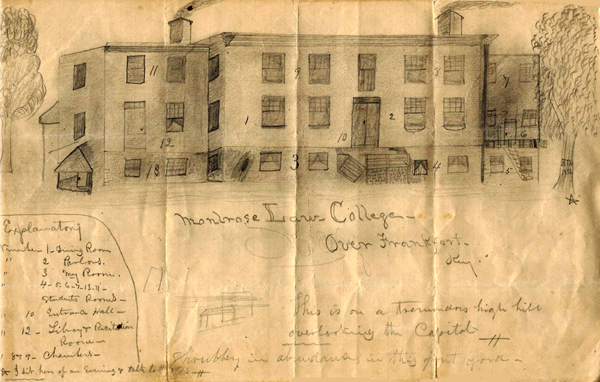 Henry Harris’s souvenirs of Montrose Law College are part of the Manuscripts & Folklife Archives of WKU’s Department of Library Special Collections. Click here to access a finding aid. For other collections relating to law and lawyers, search TopSCHOLAR and KenCat.